It is with sadness but celebration, that we hear of the passing of a true pioneer and the Grand Madame of pediatric audiology, Marion Downs. 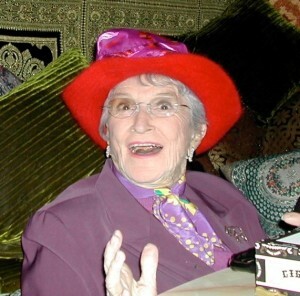 As she lived her life, she passed away with dignity and grace on November 13, 2014. 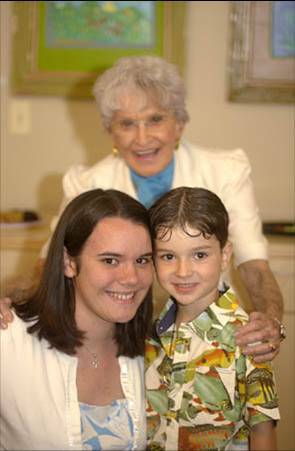 At 100 years of age, she leaves a legacy that touches all of us; parents for her perseverance in the implementation of newborn hearing screening and advocacy for parent choice; children who have better outcomes and opportunities as a result of early diagnosis and intervention; professionals in audiology, medicine and deaf education who have had the benefit of her teaching, influence, and mentorship; and mankind for a woman who taught us all to “Shut Up and Live” with meaning, laughter, and pride. 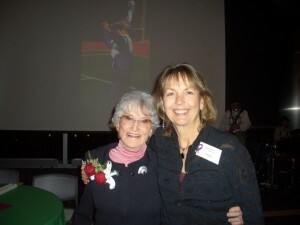 I was fortunate to have Marion as a teacher when I was a graduate student and as a mentor throughout my career. As a parent, she helped me gain confidence in my own advocacy abilities for my daughter and for her education. Marion will remain a role model and guiding light as we continue our advocacy work on behalf of parents and children who are deaf and hard of hearing. Her influence changed our world and inspired many. May her legacy be not only the grace, kindness, and patience with which she treated people, but also her optimism, determination, and fearlessness in living her life. If you didn’t get a chance to meet her, she was a spitfire of a lady: grounded, interested in all of life, and just sparkling with energy and drive. 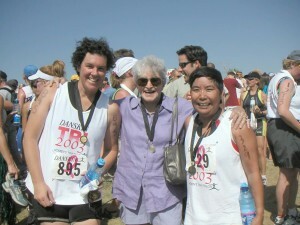 She packed several lives into her century: skydiving and triathlons, research and authorship included. I got such a kick out of her story about why she chose audiology: that enrollment line in college was the shortest! We are glad you picked “our” line, Marion, but I do have the feeling that any field of study would have benefited from your closer look at how things are and how they might be. At Hands & Voices, we truly appreciate her respect and encouragement of families to truly have a place at the table in designing systems for hearing screening and follow up. Her friend and co-worker Dr. Jerry Northern introduced her at her 100th birthday party last January. He remembered something she often quoted: ‘Live for today…plan for tomorrow…but let’s party tonight!’” Work hard and play hard – it’s a good motto. I was fortunate to live in Colorado and be a part of the Marion Downs National Center as the parent consultant starting in 1996. It was there that I began to get to know Marion. My favorite memories of Marion include being in committee meetings with her when a group of us would be discussing a complex issue or situation, and begin to commiserate on why something couldn’t get down and/or why the system couldn’t change. At some point in the meeting, Marion would speak up and say, “Well, let’s just get it done”. And that was it. She never looked at why something couldn’t happen, but just to keep moving forward and MAKE things happen on behalf of families and kids who are Deaf/Hard of Hearing. I always thought Marion was just one of those ‘lucky’ older individuals that didn’t have to deal with what others had to deal with in old age. She was just one of the lucky ones for whom age didn’t really matter. 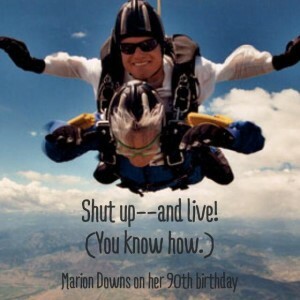 It wasn’t until I read her book, “Shut Up and Live” that I realized that Marion was human after all, that she was subject to the same ailments and challenges of growing older – but there was a difference! In spite of those things, she kept busy, active, moving forward, jumping out of airplanes, contributing to her lifelong commitment in her career to improve the lives of children. The world was a better place with her in it! She will be missed.